The late Thomas Quinn and his wife, Diane, have made a $5 million gift to the University of Notre Dame for the construction of the second phase of Innovation Park. The Thomas H. and Diane G. Quinn Hall for Innovation and Change will be a 40,000-square-foot, three-level facility located on a 12-acre site immediately south of the Notre Dame campus on Angela Boulevard. Construction is expected to begin late this fall or early winter. A 1969 Notre Dame graduate, Quinn passed away April 29. He was 68. An increase in research funding at Notre Dame over the past decade has led to the emergence of new business startups and strategic partnerships with commercial market potential. Quinn Hall will provide space for 25 to 30 startup companies, incorporating thematically designed pods for open collaboration between teams and prospective investors from particular commercial technology sectors. Quinn Hall will include dedicated space for the IDEA Center, a new initiative designed to bring the best Notre Dame faculty and student ideas and innovations to market. The IDEA Center will provide technical services and expertise for idea development, technology translation, business formation and commercialization. The current Office of Technology Transfer and the staff of Innovation Park will be joined with several new initiatives to comprise the IDEA Center. 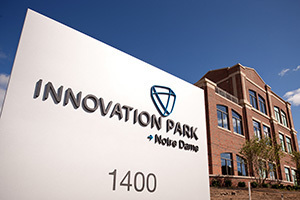 Innovation Park seeks to cultivate marketable innovations in an environment with access to Notre Dame’s research, students and faculty, and global network of alumni and friends. Since its opening in 2009, 59 new ventures have launched at the park, 29 companies are currently operational, 38 Notre Dame faculty members are working there, 67 Notre Dame student interns are employed by ventures and 15 companies have secured significant outside funding. The park’s occupancy rate is 90 percent. Thomas Quinn earned a bachelor’s degree in economics from Notre Dame and was a football monogram winner and member of the 1966 national championship team. Diane Quinn graduated with a journalism degree from the University of Kansas. Thomas Quinn was a managing partner and member of the Investment Committee and Management Committee of The Jordan Company (TJC), a private investment firm that acquires, manages and builds companies for its partnership accounts. He also was president and chief operating officer of Jordan Industries Inc., a Chicago-based corporate conglomerate. Quinn served on the advisory council for Notre Dame’s Mendoza College of Business. Other gifts from the Quinns include the creation of the Quinn MBA China Immersion Program, the renovation of the Morris Inn and support for the Business on the Front Lines initiative in Mendoza and the President’s Circle. Originally published by Dennis Brown at news.nd.edu on August 29, 2016.